Hi Everyone! I'm Sarah from Shorelines and Sunshine and I wanted to share with you all today my favorite chapstick choices. Growing up in the Midwest, I definitely know how to stay warm during the winter months, and the wrong chapstick can completely ruin your day. I find that it's best to avoid anything with peppermint or mint oils in it because those tend to chap lips even more, and I love using products that are organic or good for the environment. Chapstick Moisturizer. It's the most simple and for me, works the best of anything I've tried. It's so smooth, and I love that it has SPF 15. I've also found that it works great with lipsticks if you want to create a lip stain. 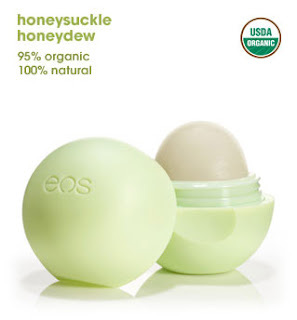 EOS lip balm in honeysuckle. I recently tried this and I'm in love! I keep one in my backpack for school, and although it rolled away once, it's been super reliable and trusty ever since. I always get complements on how it looks from others, and it works better than I could've imagined. I definitely want to try the hand lotion and smooth stick. 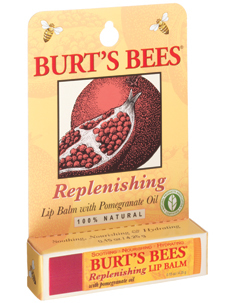 Burt's Bees with Pomegranate Oil. I use this whenever I want really great hydration, but also a little color. Something about the pomegranate in the balm makes my lips turn the most natural rosy shade. It's really nice when I don't want to wear lipstick, but want to have a little color. What are you favorite chapsticks? Any recommendations? A HUGE thank you goes out to dWa for letting me guest post while she's away on college visits. I remember when I was going on those four years ago.